The University of Louisiana at Lafayette will begin implementing another tier of its emergency notification plan this month with the activation of FirstCall – an interactive communications network. The FirstCall system uses voice, email and text messaging to alert registered users to emergencies on campus. All campus phones will be connected to the system and all active university email addresses will be entered into the system’s database. Also, students will have the opportunity to provide additional email addresses and phone numbers for emergency voice and/or text messages. For example, a student may choose to include his/her parents' home phone number as an additional contact number. 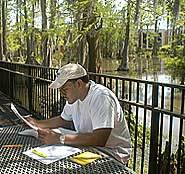 UL Lafayette students and employees are encouraged to register contact information online at http://ens.louisiana.edu. The university was one of the first in the state to implement emergency messaging when it rolled out a plan with Mobile Campus in 2007. This system uses text messaging to notify subscribers to events on campus. Although FirstCall will now be the university’s emergency text messaging service, Mobile Campus will continue to serve as a mobile communications tool for campus organizations and students. The more than 3,000 subscribers to MobileCampus.com should check the online registration page for FirstCall (http://ens.louisiana.edu) to add or confirm their contact information. “ The missions of these companies are different and we think this is an ideal way for them to co-exist on campus,” said Pons. The FirstCall service is part of an initiative by the Louisiana Board of Regents and supported by the University of Louisiana System. • Departmental radio receivers: These emergency radio receivers broadcast alerts through the National Weather Service Network. These alerts – known as local area emergency alerts – can be broadcast to the 125 radios on campus. • 482-2222 Hotline: In a case of emergency, a message would be recorded on the university’s hotline number at 482-2222. This hotline has been in place for several years and can include recorded messages during all types of crises whether the emergency is violence-related or because of weather conditions like a hurricane. • University website: Much like the hotline, the university’s website (www.louisiana.edu) will be a resource for distributing messages during emergencies. A text-only site has been developed and will replace the homepage in case of emergencies. The university is planning to regularly test its FirstCall emergency text messaging system to ensure messages are being received.